Today’s office environment is constantly changing due to new technologies and a tough financial atmosphere. Are you worried about job security? Do you wonder why you can't seem to find your place in the office staff? Are you frustrated that your co-workers haven't really accepted you as part of the team or seem threatened by you and your work? Then you need this guide to help you get established and begin to contribute in a recognizable way. It will also help a long-time employee discover how to be considered as a valuable member of the office team. 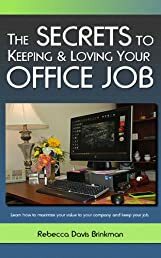 Author Rebecca Davis Brinkman has worked as a freelance business writer, a features editor and in administrative and communications positions for all sizes of companies and organizations for over 30 years. Mahatma Gandhi and His Myths: Civil Disobedience, Nonviolence, and Satyagraha in the Real World (Plus ..